Example 1: Great Bahama Bank Facies. The Great Bahama Bank encompasses an area of approximately 96000sqkm. The facies are asymmetric and have a sheet-like geometry, precipitous sides with a sharp facies gradient but broad, flat interiors. 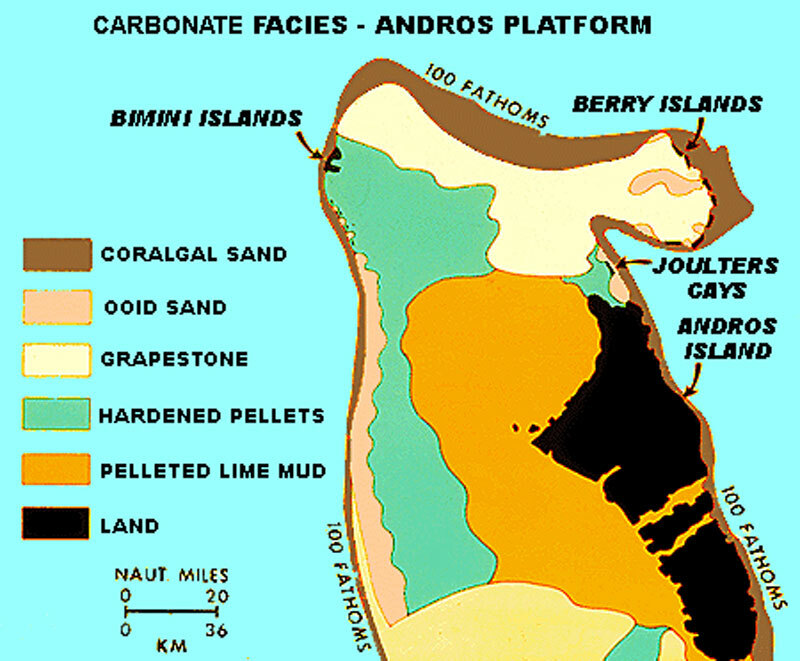 They include reefs on the eastern margin, a bank margin composed of coralgal and oolite sediments, and a bank interior composed of oolitic-grapestone, lime mud, and pelleted mud. Andros Island prevents the east-west movement of water across the bank. This area is characterized by muds and pellet muds. Overall the sediment is largely biogenic. Islands are located on northern margins with reefs in front. The banks are hit by waves causing good circulation throughout the region. Mud is localized to tidal flats on south side of the nearby islands. Everything else is skeletal grain and ooid sand. < a="">This formation has a platform rimmed by stromatoporoid reefs, with the platform interior composed of interbededded skeletal, sand flat grainstones and packstones and peritidal plana strombolites (ex. Triassic strata pictured below). These sites are typically covered in biogenic gravels and sands from bryzoa, molluscs, echiniods, corals and gastropods. The Three Kings Plateau is located off the northern coast of New Zealand, a site of active nutrient upwelling which is swept by vigorous wind, storm waves, and tidal currents. Facies belts are depth related resulting in a wide variety of biotic communities. The seafloor is covered by bryzoa/bivalve/ahermatypic coral sands and gravels with no mud. Active skeletal production is limited to inshore regions, areas of rough seafloor topography, and ridge and bank crests. Sediment from this site were most likely produced during low sea level stand. There are no examples of epeiric shelves in the< a=""> modern day so all of the following materials<> refer to ancient epeiric shelves. They existed during the highstand of Sloss super-sequences, when continents were deeply submerged. There are at least two models that can be used to explain the conditions and the processes associated with ancient epeiric shelves. The following model assumes that tidal currents were not maintained across the platform because of the shallow water has a dampening effect. Circulation is rather restricted, only influenced by wind driven waves. Storm events play a major role in shaping the environment. C. Zone Z: inner shelf. Protected, quiet water zone between shore and barrier shoal zone (Y). Tens to hundreds of km wide. Complex facies relations ranging from subtidal "lagoon" facies to intertidal mud flats. Salinity and fauna may range form normal marine to highly restricted (hypersaline) in cases of high evaporation or brackish in cases of high coastal runoff. Syngenetic dolostone & evaporites; diagenetic dolostone. Dolomite forms from high Mg++ brines. Syngenetic (chalky) dolostone assoc. with anhydrite/gypsum in hypersaline mud flats. Examples: Ancient eperic shelf successions include the late PreCambrian to Ordovician of China, the Cambro-Ordivician of North America, the Triassic to Jurassic of Europe, and the Tertiary of the Middle East.